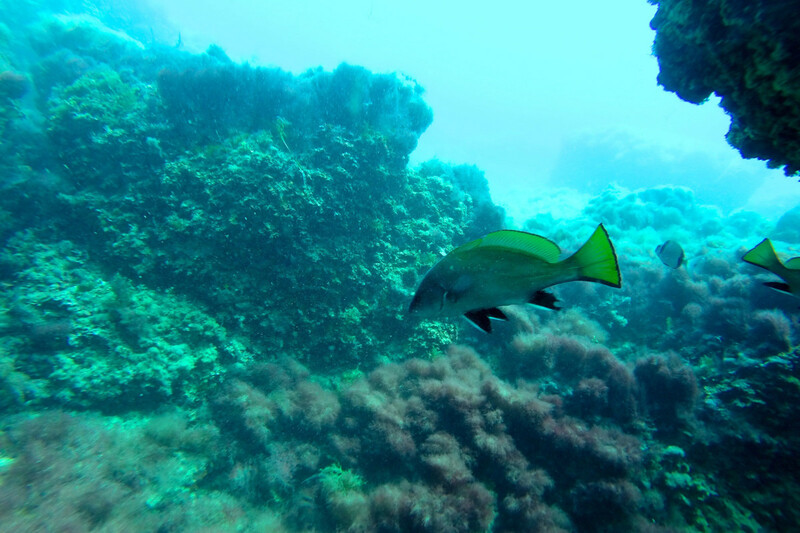 Our first scuba dive adventure. For January we have booked a 24 days holiday to Thailand and Vietnam. After visiting Bangkok and Chang Mai we will fly to Phuket and from there 9 days of island-hopping at South Thailand. 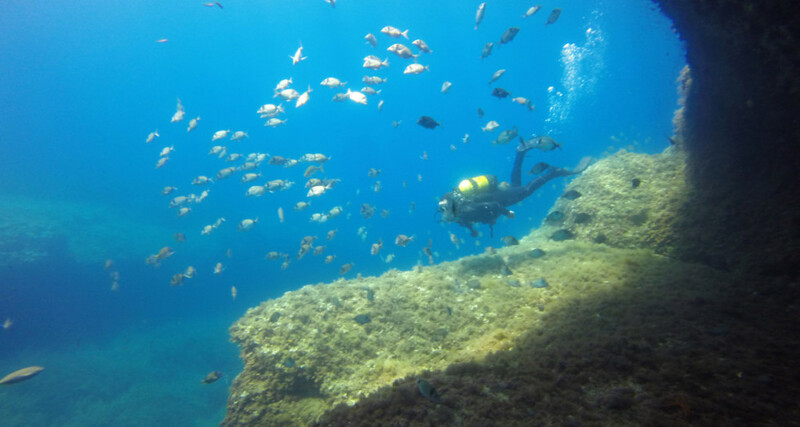 So we came up with the idea to do scuba diving there. But we did not want to lose too many vacation days doing lessons. 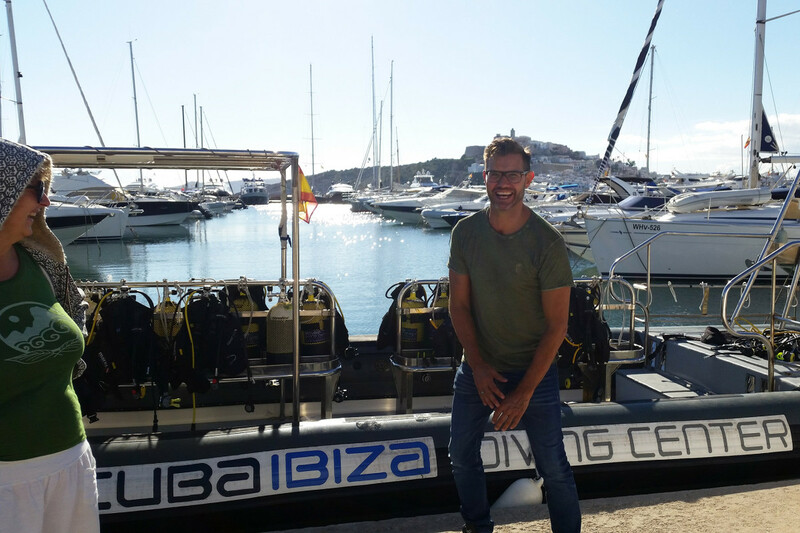 Our friends Joan and Frank, Dutch but with a house at Rocca llisa, are Padi Divemasters and suggested to do the course already on Ibiza. 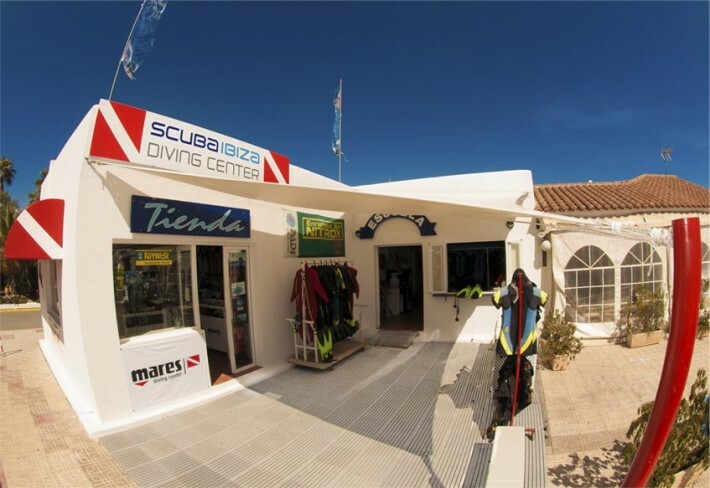 They tipped “Scuba Ibiza Diving Center” at Marina Botafoch. 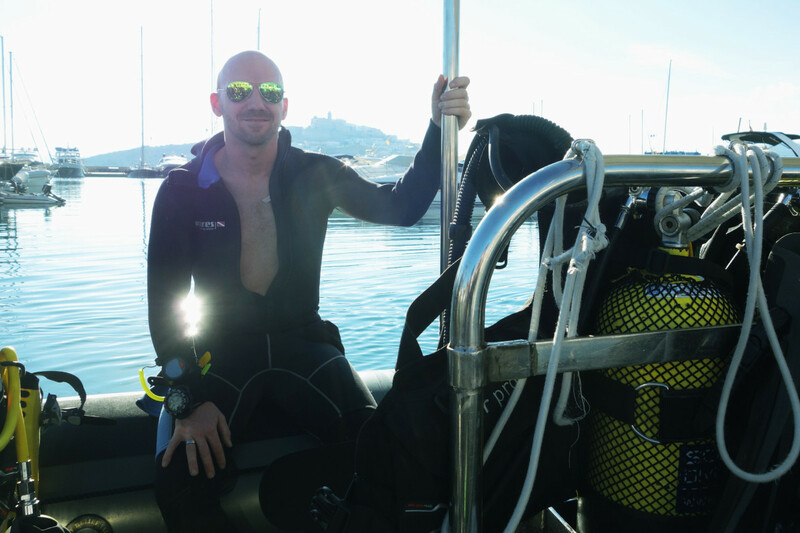 I went there for an interview and the next day we decided to take the beginners course OWD (Padi Open Water Diver). It was 1 dive in a swimming pool and 4 dives on open water from a boat. 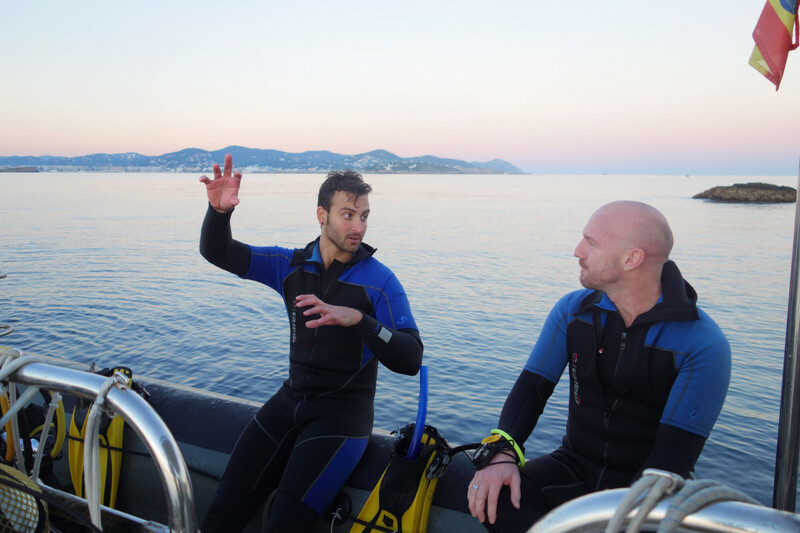 But before we could do our first two open water dives we had to do three of the five chapters of the theory book online. The school can log in your test at the end of each chapter and see if you are really doing all of them. Before we could start we had to do a doctor’s examination to see if we were healthy enough to do the diving sport. We had to fill in a questionnaire and a doctor came to the Diving Center to measure our blood pressure, listen to our heart and look into our ears, nose and throat. We both passed the health test. During the first swimming pool dive we already had lots of fun with our teacher Vidal. For more than two hours we were at the bottom of the Can Mises swimming pool doing all kinds of exercises. After the swimming pool dive we were ready for the dive from the boat. 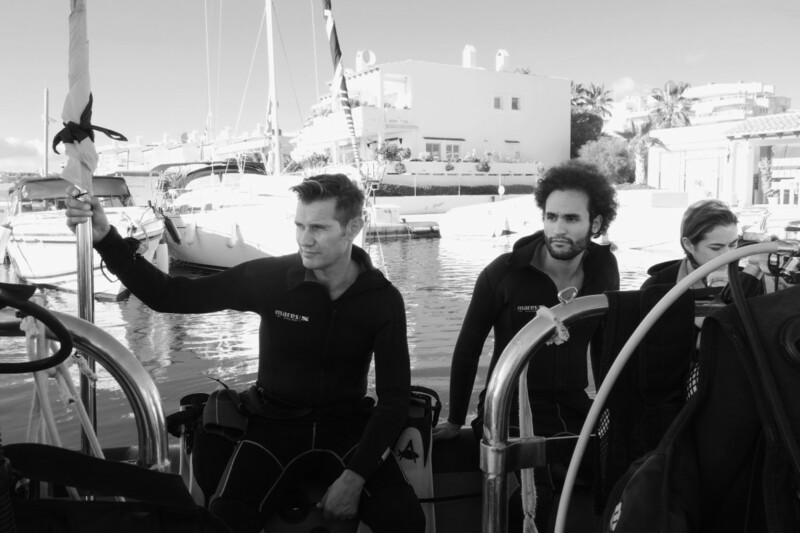 This “Open Water Dive” was planned on Saturday afternoon the 24th of October, but got cancelled a few days before, because there was too much wind. 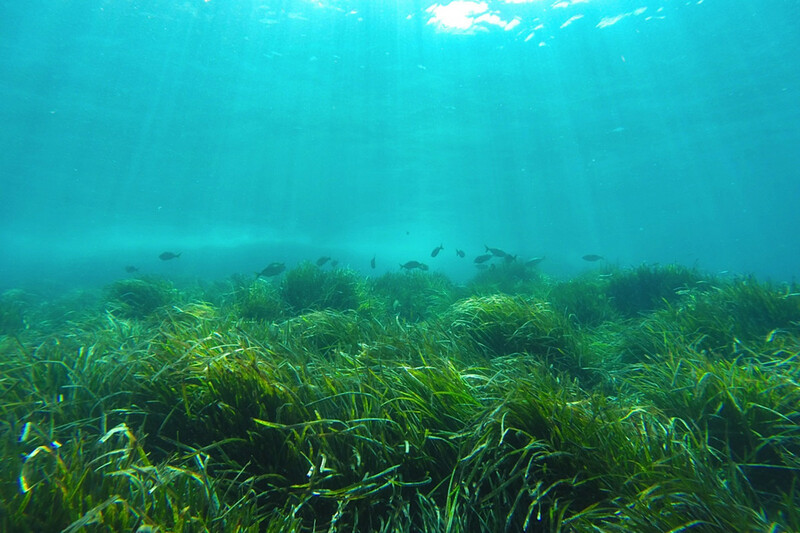 From the theory lessons we already learned that heavy wind make heavy waves, which means currents underwater. And the weather was awful that weekend, so good that we did not go! 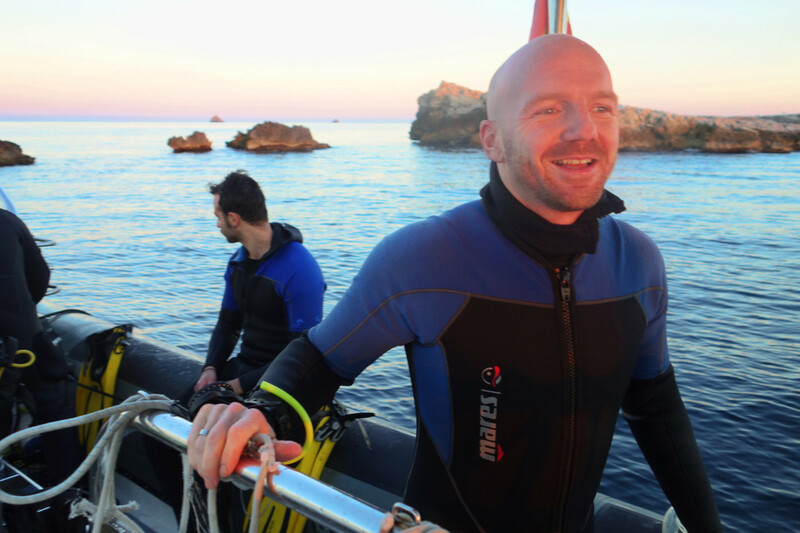 So we did our first two dives on Saturday the 31st of October. Start at 2:30 PM right after closing time of the HACO-store. 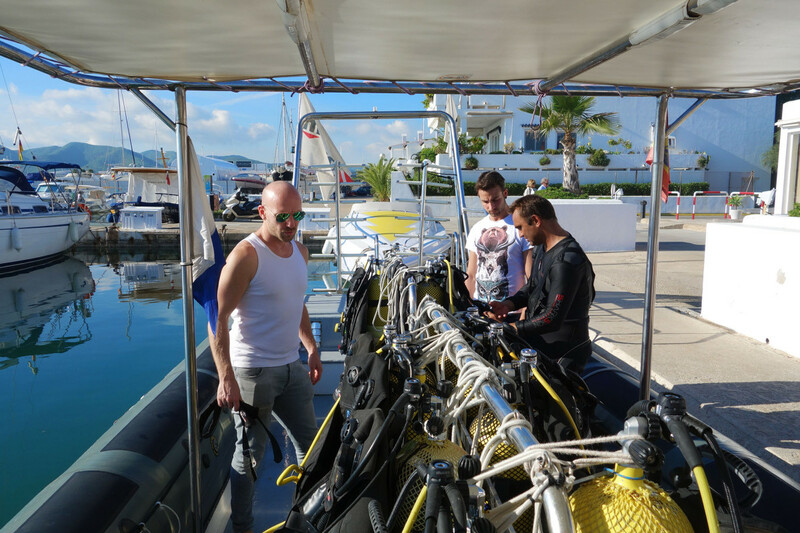 First we got our wetsuit, shoes and fins at the diving center and then we had to go to the boat to fasten our scuba tanks on the vests. 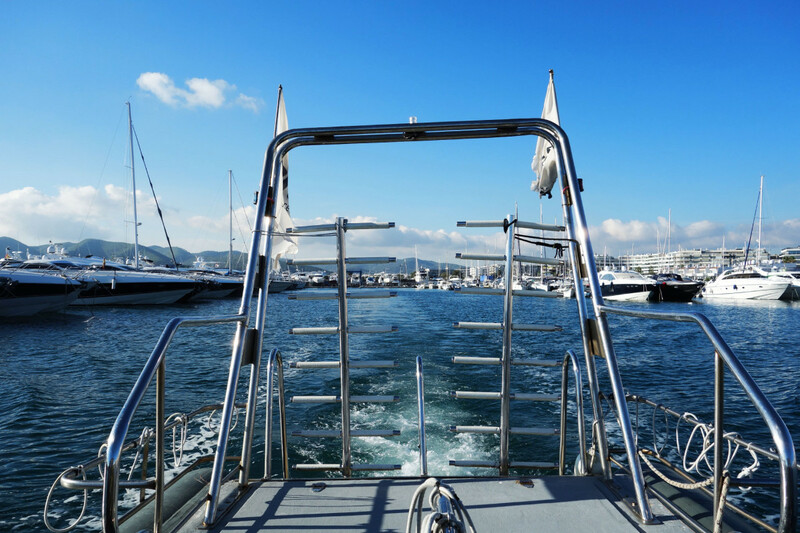 We sailed out of the harbor of Marina Botafoch accompanied by two German ladies and had our first two dives at Malvin North in front of Figueretas. You can not dive without a “buddy” so Johan and I were buddies. 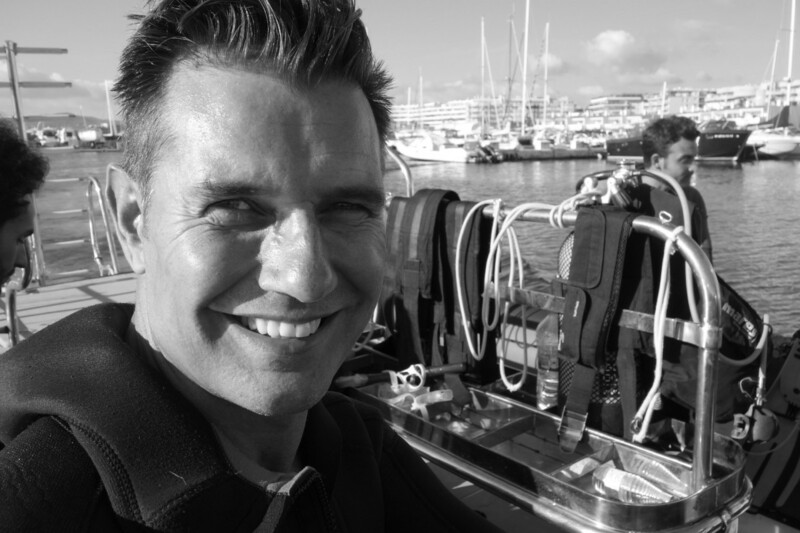 The first dive was 12 meters deep for 35 minutes, the second dive again 12 meters deep but lasted 38 minutes. Above water it was 22 degrees and in the water it was still 20 degrees, but we both got very cold at the end. Also my mask was full with water the whole time. 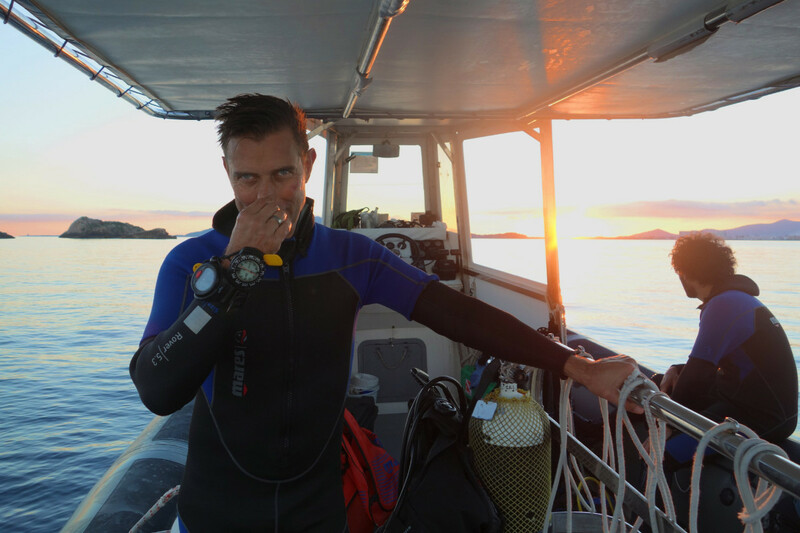 I had to clear my mask so often during the dive that the teacher Yaqui gave his mask and he asked me to shave my mustache shorter for the next time. Also I had to clear my ears very often. But the underwater world was fantastic! We had to do exercises like ascend with a rope or one of us had to play unconscious and the other had to bring his buddy to the boat and visa versa. Exhausted we sailed back to the harbor, watching a beautiful sunset. 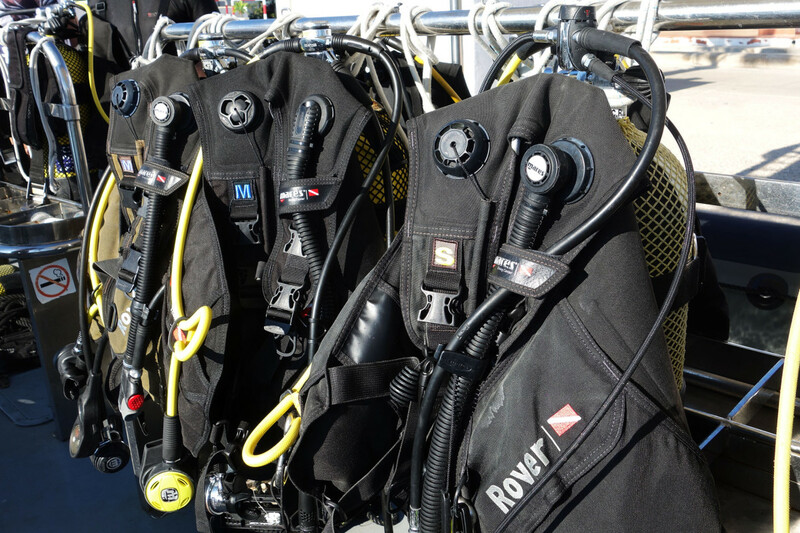 At the Dive Center you have to clean your suit, fins and shoes and you can take a hot shower. For the third and fourth dive you had to learn chapter four and five of the online theory book. 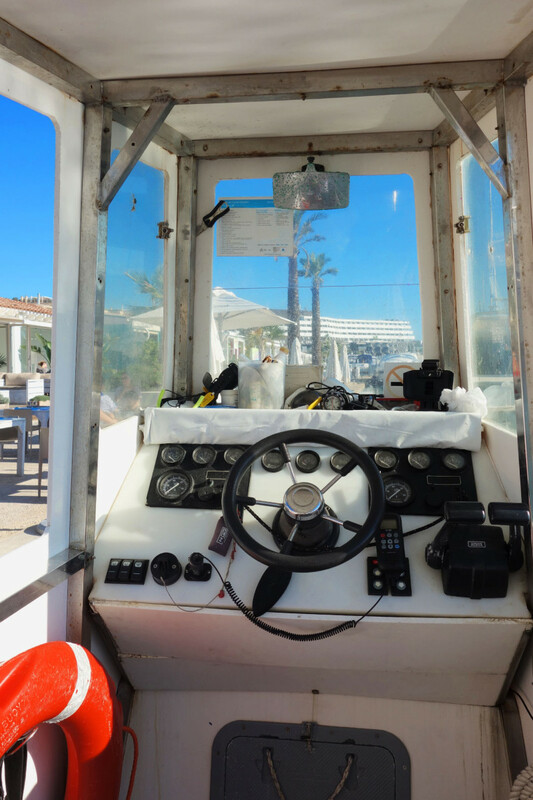 If you are not finished with the theory tests, you can not make the last two dives. 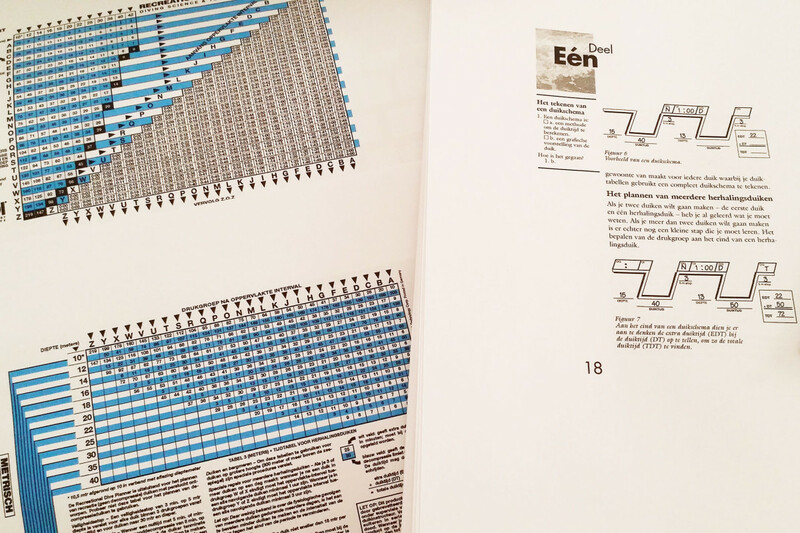 Johan was already finished with the tests in the beginning of the week. 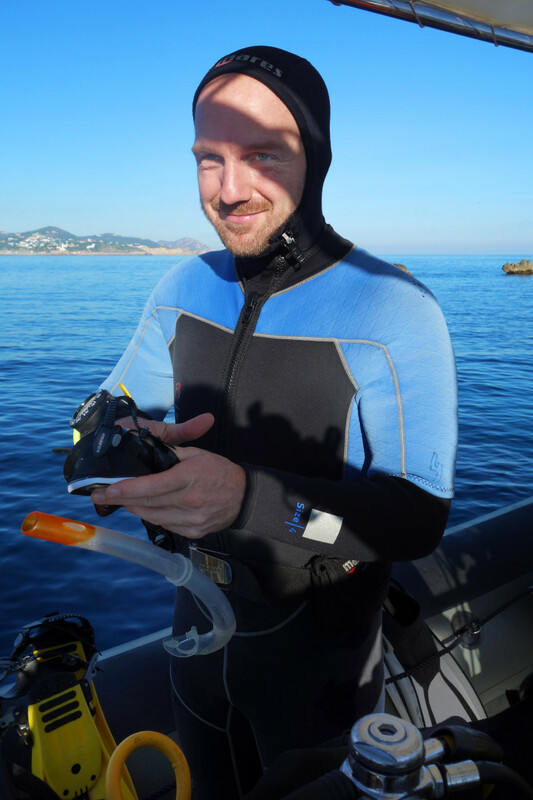 He had warned me that at the end of chapter four you think you are finished and then you have to print a PDF-file with a lot of exercises to calculate the amount of nitrogen which stays in your body after your first dive (so your second dive has to be less deeper and less longer). But I was so “busy” that week with designing prints for my “new China project” (more in another blog item) that I waited with the lessons until Friday afternoon. I just stopped at the part where you have to print the PDF-file, watched “The Voice” and we went to bed. The next morning I started at 10.00 AM but when I printed the nitrogen calculations it was another book of 40 pages! I was just finished at 2.15 PM and our course started at 2.30 PM. A bit too late we arrived at the Diving Center. Again we had to check our tanks and vests. This time we had company on the boat of an Italian guy Rosario, who had his Padi already but had not dived for two years and an experienced Spanish couple. This time I shaved my beard and mustache totally and chose the black mask, which is more tight on my face. 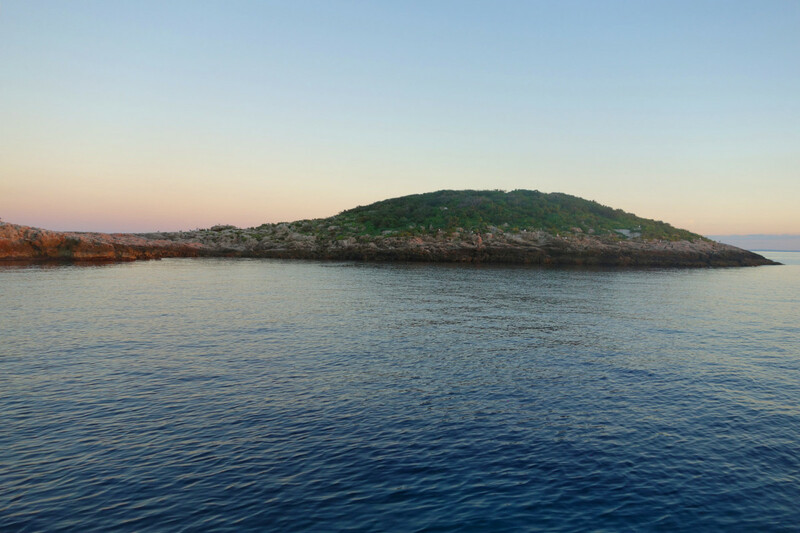 We sailed again to Malvin North, which also is called turtle island, because of it’s shape. 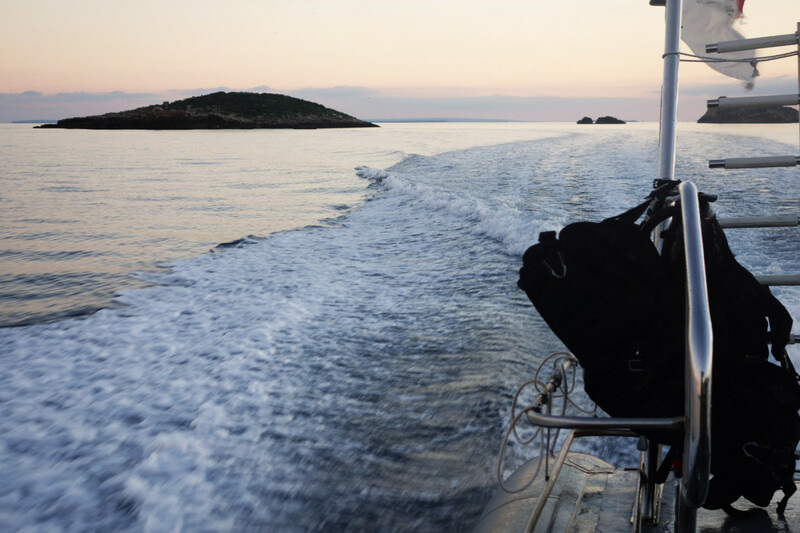 Our first dive was 38 minutes on 12 meters and our second dive was 39 minutes on 11 meters, where we had to do exercises like navigation with a compass and slow ascend without a rope. 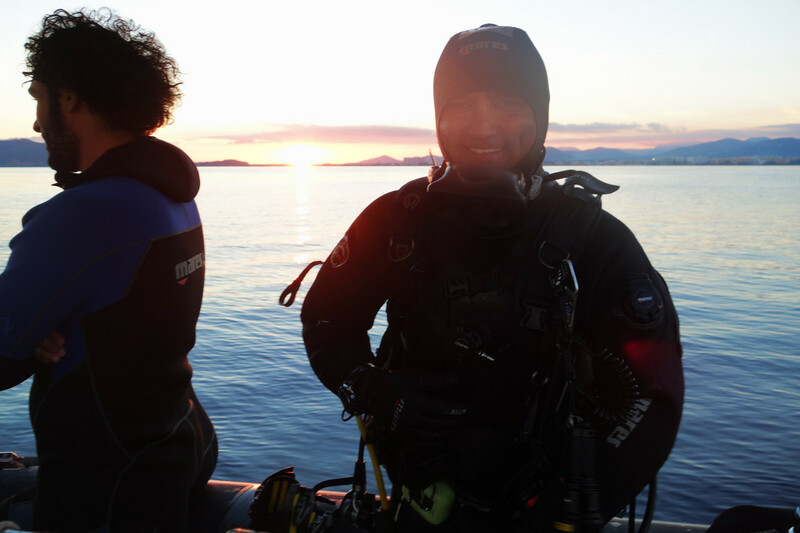 These two dives were extremely beautiful. 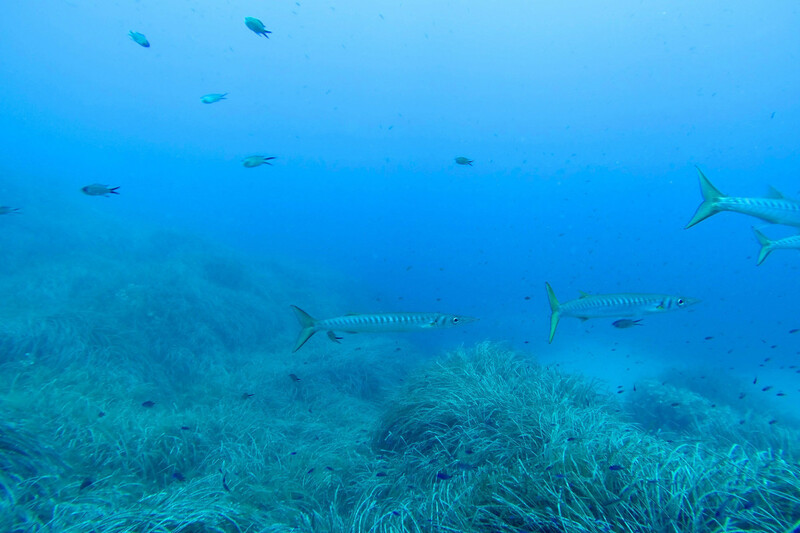 One moment hundreds of blue fish were circling around us, we saw a moray eel in a cave and big barracudas. We did not get cold although the water was 20 degrees again, I only had to clear my nose three times and there was no water under my mask, so shaving the beard and mustache helped. 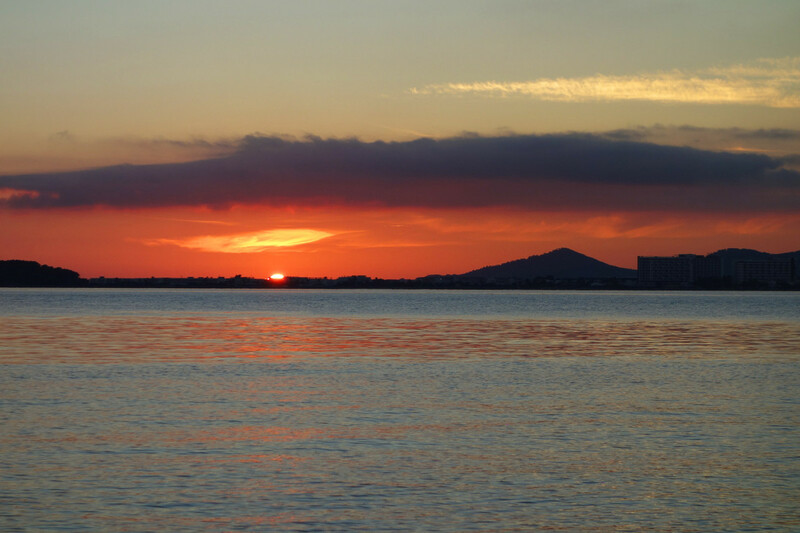 Again a beautiful sunset when we sailed back to Marina Botafoch harbor, this time less cold. Our teacher Yaqui already congratulated us with the dives, but we still had to do a test with 17 questions at the Diving Center, to see if we had not cheated during the online study at home. 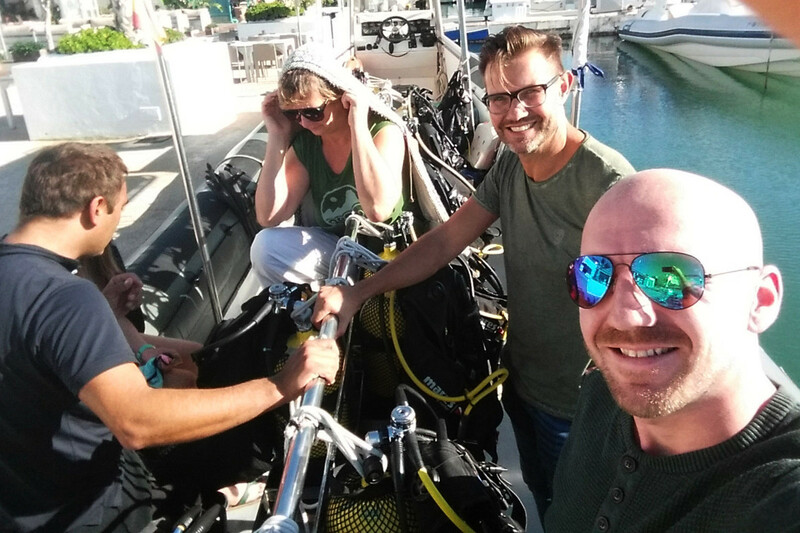 We passed our exams with both one mistake, so we were officially a “Padi Diver” which you can show worldwide to do dives together, without a class or teacher. But we were so enthusiastic that we right away registered for the “Padi Advanced Diver-course” so we could go deeper than 18 meters. They had an offer where you get 6 dives plus two extra dives for free. 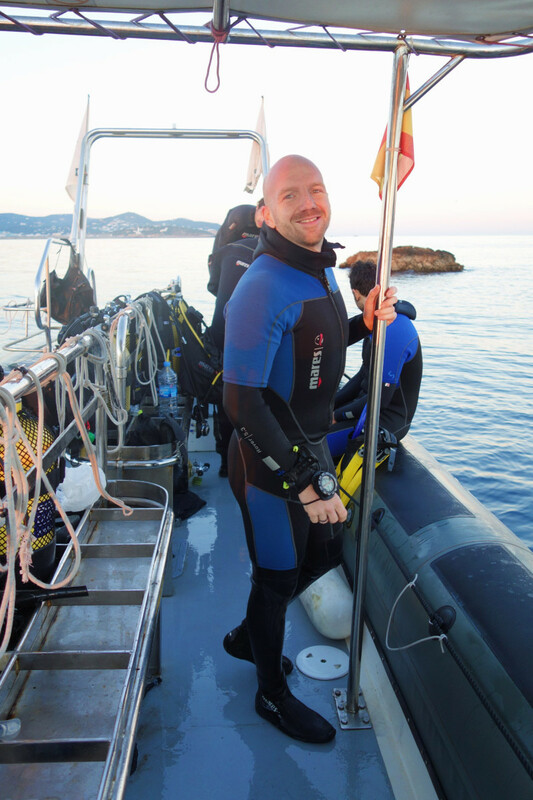 The course included an extra navigation (compass) dive, a wreck dive, an extra deep dive and two dives with nitrox, enriched air (less nitrogen, more oxygen) with which you can stay longer on the bottom of the sea. 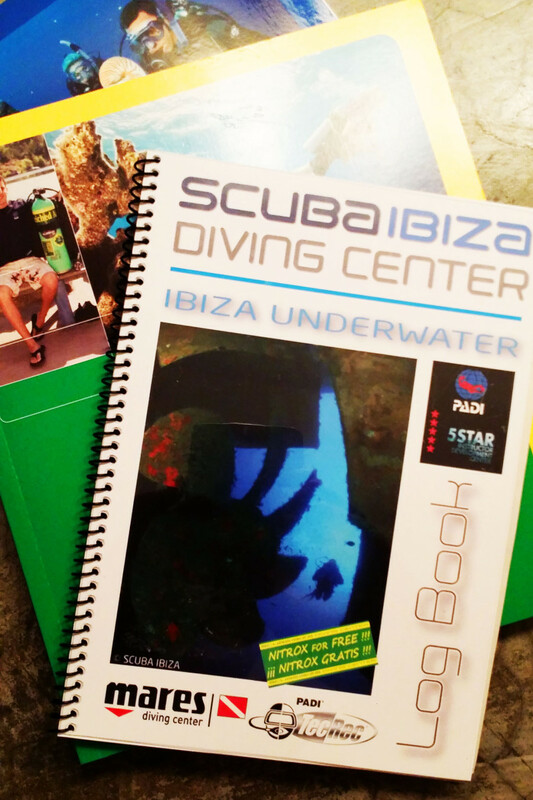 We got our Log Book and Yaqui helped us to fill in our first four dives. Exhausted but satisfied we went home and we treated ourselves to a nice dinner at a restaurant, a drink at Sunrise bar and Johan went dancing at the Pacha with friends Alex and Lutz. 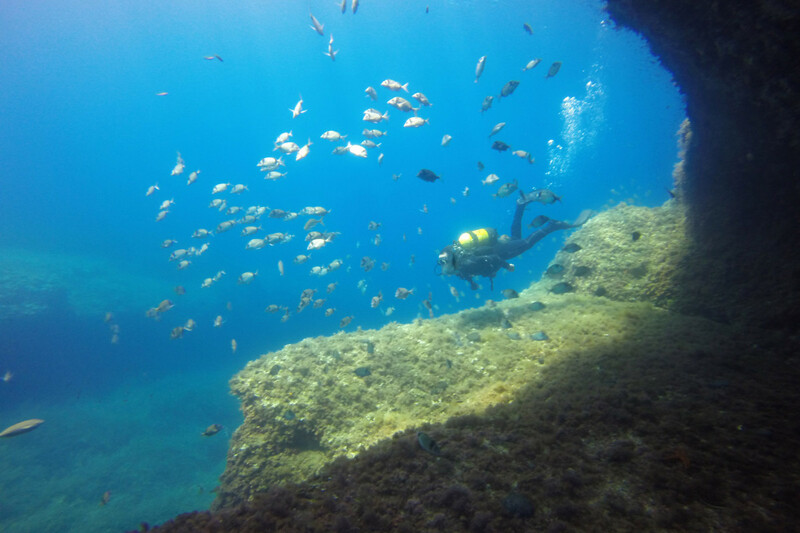 Next Saturday and Sunday we will make three dives. Before that time we have to learn the book about nitrox-diving. And this time I won’t start on Friday afternoon! Wauw what a journey! Love the sun shining on the water. Beautiful, enjoy! Bedankt Diederik. Nu onderweg in Thailand, ook heerlijk!